Organic semiconductors enable the fabrication of large-scale printed and mechanically flexible electronics applications, and have already successfully established themselves on the market for displays in the form of organic light-emitting diodes (OLEDs). In order to break into other market segments, improvements in performance are still needed. In semiconductor technology, "doping" refers to the targeted introduction of impurities (also called dopants) into the semiconductor material of an integrated circuit. These dopants function as intentional "disturbances" in the semiconductor that can be used to control the specific behaviour of the charge carriers and thus the electrical conductivity of the original material. Even the smallest amount of dopants can have a very strong influence on electrical conductivity. Molecular doping is an integral part of the majority of commercial organic electronics applications. 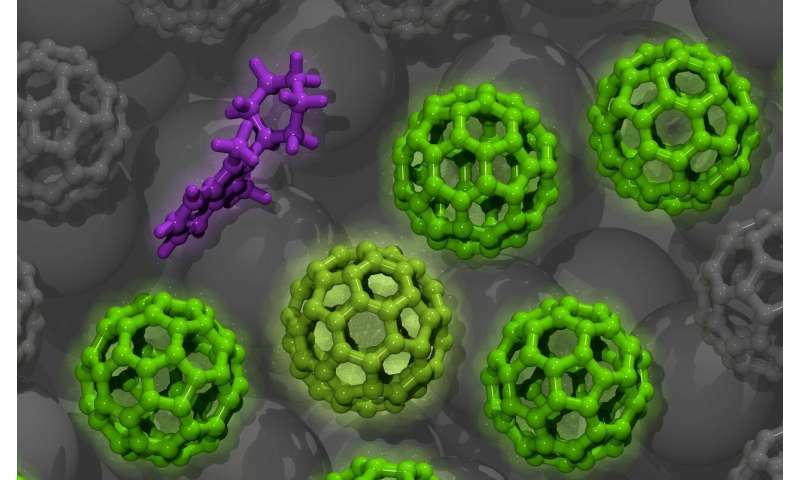 Until now, however, an insufficient fundamental physical understanding of the transport mechanisms of charges in doped organic semiconductors has prevented further increases in conductivity to match the best semiconductors like silicon. Researchers from the Dresden Integrated Center for Applied Physics and Photonic Materials (IAPP) and the Center for Advancing Electronics Dresden (CFAED) at TU Dresden, in cooperation with Stanford University and the Institute for Molecular Science in Okazaki, have now identified key parameters that influence electrical conductivity in doped organic conductors. The combination of experimental investigations and simulations has revealed that introducing dopant molecules into organic semiconductors creates complexes of two oppositely charged molecules. The properties of these complexes, like the Coulomb attraction and the density of the complexes, significantly determine the energy barriers for the transport of charge carriers and thus the level of electrical conductivity. The identification of important molecular parameters constitutes an important foundation for the development of new materials with even higher conductivity. The results of this study have just been published in Nature Materials. While the experimental work and a part of the simulations were conducted at the IAPP, the Computational Nanoelectronics Group at the CFAED under the leadership of Dr. Frank Ortmann verified the theoretical explanations for the observations by means of simulations at the molecular level. In doing so, the researchers have created a comprehensive foundation for new applications for organic semiconductor technology.